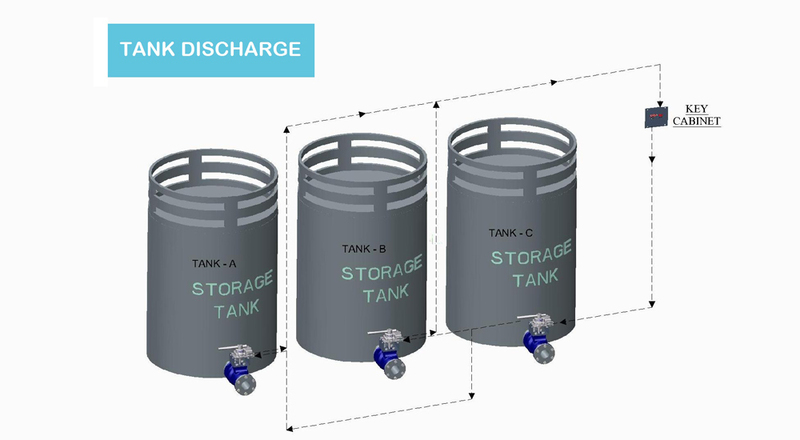 When discharging storage tanks in Petrochemical or Chemical plants there is often a hazard of mixing two or more chemicals if one forgets to close a discharge valve before opening another. This can lead to product degradation or more serious and dangerous chemical reaction. During normal operation only one tank should be opened at the same time.To prevent opening more than one valve at the same time aPSS valve Interlock can be installed on each individual valve leaving them all "Locked Closed"position to be operated with the same key. This key can be stored in a key cabinet in the control room.